Debt woes, talk of a double-dip recession, doubts about the economic recovery… Well, all this gloom and doom got investors flocking to the safe havens! Wait a minute. If safe havens are the hotspots right now, how come the Greenback still seems to be falling against its counterparts? The US dollar index, which shows the value of the Greenback relative to a basket of currencies, slipped from a high of 89.225 in June to a low of 81.466 this month. Isn’t the US dollar the ultimate safe-haven currency? By the looks of it, investors seem to be dumping their dollars for those shiny gold bars. After all, who can resist buying some bling-bling and looking like Big Pippin? 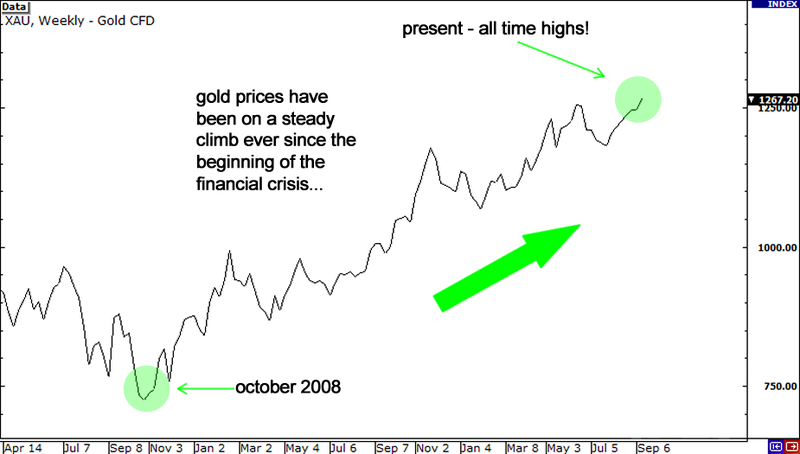 But before we get ahead of ourselves, let’s first get the lowdown between gold and the dollar. Most of our buds who have a knack for playing in the financial markets know that the two safe havens share a strong negative correlation. You see, gold’s relative rarity and historical significance as a medium of exchange make it one of the most precious metals in the world. Unlike paper currencies such as the dollar, the price of gold is determined primarily by supply and demand and is not affected by monetary policies. So, investors usually place their bets on the shiny yellow bling-bling whenever they feel a crisis brewing. They think that if disaster strikes, paper monies may lose their value, but gold will not. Also, bear in mind that those gold bars are priced in dollars. If we put the pieces together, we see that when the dollar is weak, it takes more of it to purchase gold. This then boosts the bling-bling’s value. Conversely, when the dollar is strong, you need less purchase an ounce of gold. However, the two assets aren’t always indifferent with each other. In the past, they would usually move together during times of economic crises when investors would rush in to buy US government bonds. The rationale behind that was that the US would be able to pay off its debt. However, it looks like things have changed now though, as it seems like US T-bills aren’t getting hollers from investors despite ongoing economic uncertainty. This week, gold set a new record high of $1290.70 per ounce, marking its biggest gain since February. Gold prices are now up by around 16% this year as risk aversion has propped up demand for safe-haven assets. What does this mean if this risk sentiment continues? Considering the weak economic figures we’ve been seeing from the US lately, as well as the prospect of Quantitative Easing Round 2, we may see a continuation of the strong dollar sell-off we saw earlier this week. Unlike in Entourage, where Ari Gold’s life is falling apart, we may see a premium placed on gold. After all, while the dollar might be the world’s reserve currency, it seems to me that gold is a far better option as this point. Meanwhile, the Australian dollar may stand to benefit from the rise in gold prices. Remember, gold is one of Australia’s flagship export industries. With the demand of gold sky rocketing as investors decide to kick it like Midas, the Aussie could establish new multi-year highs and take its place atop the currency markets. Of course, we never know what may happen in the markets. Sentiment has (and will continue) to change on a dime. With all the uncertainty in the markets right now, is gold really our best option?